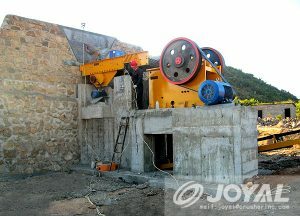 Jaw crusher is a common equipment for ore crushing and processing. Jaw crusher in gravel production line is often used for coarse crushing of ore. Lining is a key component of jaw crusher used to adjust the size of production materials. Jaw crusher The liner of the machine is constantly worn by the ore during the work, so that the width of the discharge port gradually becomes larger. In order to ensure the granularity of the product, the width of the discharge opening must be adjusted in time. Jaw crusher commonly used in the discharge port adjustment device has three basic forms, and it is these three basic forms that constitute the jaw crusher output material size adjustment, jaw crusher can meet the production requirements, the main See if the adjustment of these three jaw crushers can work. Shanghai Joyal Mining Machinery Co., Ltd. is here to talk about the device that can adjust the discharge port width in a jaw crusher. Paddle plate adjustment device in a jaw crusher, which puts a set of adjustment pads behind the back plate support of a jaw crusher. When changing the number or thickness of the pad, the back paddle may migrate or retreat. Can achieve the purpose of adjusting the width of the discharge port. This type of adjusting device is simple and compact in structure, and the weight of the whole machine is not much increased. Therefore, it is very suitable for large and medium jaw crushers. Jaw crusher discharge port adjustment method also uses inclined iron for auxiliary adjustment. The inclined iron in the jaw crusher is used to adjust the width of the discharge opening. It can make use of bolts or worm gears or chain transmission devices to lift the rear inclined iron. The front oblique iron is installed in the guide grooves of the two side walls of the rack and can only be moved horizontally. When the rear oblique iron is lifted, the forward inclined iron moves forward along the guide groove due to the inclined surface, and the thrust plate and the movable jaw move forward, and the width of the discharge opening also decreases.